Sue and I enjoyed our sailing trek through the Abacos Islands in Northwest Bahamas exploring remote beaches on isolated cays (pronounced “keys”) with stunningly beautiful water enticing us with brilliant, blending shades of azure, aqua, and turquoise in the shallow areas and rich cobalt blue in the 2,000 feet-deep ocean trenches surrounding the islands. 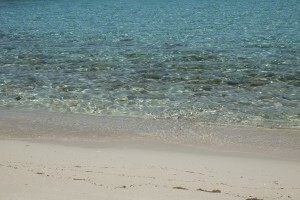 We sailed for over 100 miles in seemingly endless, mesmerically beautiful water along the Grand Bahama Bank. 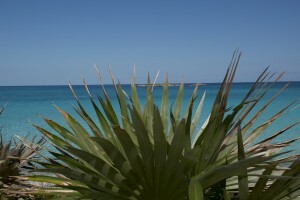 We were surprised by how few people were visiting the Bahamas in the winter. The busy tourist season is more in the spring and summer when people wanting to escape the heat of the South head to these islands which maintain a more moderate year-round temperature with steady, cool sea-breezes. 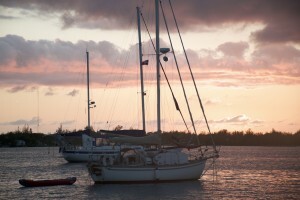 On March 4, we departed Marsh Harbor in the Abacos for a 105 mile through-the-night sail to Rose Island 5 miles East of Nassau. 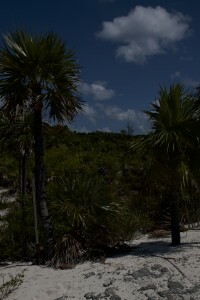 After beating into an East wind for a week in the Abacos, the winds shifted to the Northeast, a more favorable direction for our trek South to Nassau where we were to pick up our son, Jonathan, and friend, Deb, who were flying in to join us for a two-week island hopping adventure in the Exumas. It was quite a memorable sail. Northeast winds had been blowing a steady 25 knots for 36 hours prior to our departure – building a following sea for us to ride south. condition called a “rage” where miles of wind-swept rolling seas, upon meeting the shallow waters of the Bahama shelf, create massive waves (challenging small craft). As we headed through the cut, the waves increased to 6 to 7 feet. Once through the cut and safely beyond the coral reefs (which moderated the intensity of the seas), the waves increased to 15 feet where the deep ocean water met the shallow shelf. As we dropped into the trough between waves, we could no longer see the horizon, only a wall of ominous water off our port and starboard sides. We had to be careful to approach each wave on the nose so as to avoid having the waves hit us broadside which could have rolled Tusen Takk over and into Davy Jones Locker. These were the biggest seas we had ever encountered and left us wondering if we had made a prudent decision as our 11-ton vessel was lifted and tossed effortlessly by Big Blue. Once out in deep water, however, we altered course to the south and were able to sail with the wind – surfing down the waves hitting a speed of 14 knots at one point. As our hull speed is only 7 knots, doubling it was quite a ride. steady at 20 to 25 knots as Orion and other celestial friends assured us we were on the right course. Around 9 a.m. the next morning we approached the shoals off Rose Island, navigating our way through a safe passage to the lee side of the island where we dropped anchor. Running on 150% alertness through the night, it felt good to relax and enjoy the calm lee-seas and spectacular beauty around us. It was like a scene from the movie Mary Poppins when Burt draws a beautiful chalk scene on the sidewalk and the foursome jump into the imaginative drawing which immediately comes alive in a kaleidoscope of color. These beautiful cays have a similar imaginative affect – drawing you in to their surreal rainbow-pastel beauty. 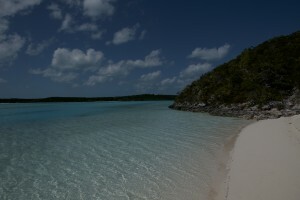 We picked up Jonathan and Deb in Nassau and sailed southeast to the Exumas, a 150 mile chain of uninhabited and inhabited small islands with postcard beaches, sunny skies, and clear brilliant-colored water. With several cold fronts forecasted to roll through with potential squalls, we ducked into Normans Cay Pond, a two-mile-long hurricane hole with 15 foot depths for a safe anchorage for a couple of days. 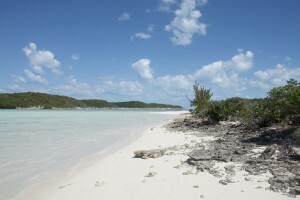 This saltwater pond is also the site where Hammerhead sharks gather each year to mate. Although our timing did not coincide with the annual shark breeding season, we did, however, have encounters with sharks. With algae growing on the hull of Tusen Takk, it was time to dive under and scrub the hull clean with scruffy pads while she was moored in 15 feet of clear visibility aqua-colored water. Deb volunteered to join me for the job. We donned face masks, grabbed scrub pads, climbed down the transom ladder and jumped in. It’s tedious work that requires taking a deep breath, diving under and scrubbing the hull for 30 seconds or so while your body’s natural buoyancy fights to return to the surface and repeating the routine again and again. We cleaned the rudder, prop and aft hull section, and I then made my way around the waterline of the boat scrubbing the algae along the boot stripe while Deb exchanged her face mask for a pair of goggles. Having cleaned the whole starboard waterline and half way back along the port side, I looked down and saw two 6’ sharks swimming beneath the keel checking us out. Keeping my eyes on the sharks who were keeping their eyes on me, I decided that the hull didn’t look as dirty as I had thought and slowly, but deliberately, swam back to the transom as Deb was climbing down the ladder and about to jump back in to resume cleaning (and to once again swim with sharks she didn’t know were there). I said with a sense of urgency: “Deb, quick, get out of the water – Now!” Deb immediately climbed back aboard and I scrambled up the ladder after her. This was our first shark encounter while snorkeling. 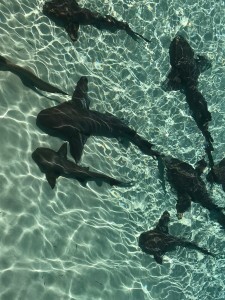 We had seen small sharks while standing on shore and large Bull sharks while standing on the pier at West End of Grand Bahama island, but to actually swim with them was quite a thrill. Note: Previously, Sue had expressed some “interest” in the notion of swimming with sharks and, needless to say, didn’t appear enamored with the idea. She asked me a couple of times prior to our encounter: “Are you afraid to swim with sharks?” I responded: “No! 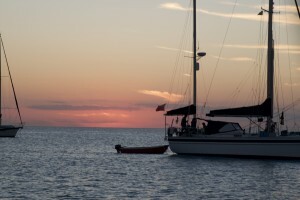 There is nothing to be afraid of…” She also asked another sailing couple we encountered multiple times during our journey if they were afraid to swim with sharks? Dale responded: No! (a clearly male response) while Kathryn responded: “Yes, I’m afraid to…” After the shark encounter, I must admit that there appeared to be a difference between the cerebral question and actually facing the question in the moment, up close and personal while swimming with sharks circling below us. Having watched the movie Jaws and seen so many shark encounters in movies and documentaries over the years, I realized how influenced I was by a “shark story” portrayed by sensationalized media. In hindsight, I think the sharks we swam with today were simply curious about who we were and what we were doing. They didn’t attack us, nor did they seem interested in taking a nibble. My response, however, stemmed more from fear than curiosity – a fear shaped by media and a lack of experience swimming with sharks. It made me want to get to know these beautiful creatures more intimately and to transform my fear of them into curiosity, respect, and affinity. deeper water to scan for sharks. After snorkeling for an hour or so, I looked out beyond the coral reef toward the shelf that dropped off into deeper water and saw a 12-foot Tiger shark swimming by us parallel to the reef. This was an amazing moment to pause and practice that transformation of fear into curiosity desire I mentioned above and appreciate this amazing animal. This Tiger shark knew we were there, but showed no particular interest in us and no aggressive behavior. Again, I have to admit that I still felt an instinctive fear and appreciation for the fact that I was not the top predator in this marine food chain (as well as a concern for my son and wife swimming along side). Sue promptly exited the water and walked back to shore via a rock outcropping while Jonathan and I continued swimming along the reef with keen-eyes scanning the deeper water (we seemed to have lost interest in the small tropical fish and became more interested in the bigger ones). They are one of the largest sharks, only smaller than the Whale shark, Basking shark, and Great White shark: adults can reach lengths over 21 feet, but average 10 to 14 feet at maturity. They have dark stripes on their skin similar to those of the land Tigers. However, the bands fade as they grow older. They are found in tropical and subtropical waters around the world but mostly inhabit a range between the parallels 45 ° north and 32 ° south. They range from the east coast of North America to the east coast of Brazil, including the Gulf of Mexico. They often approach near the coasts in relatively shallow waters. Their diet is made up of fish, mollusks, crustaceans, sea turtles, seabirds and even mammals such as wounded and immobile cetaceans. Tiger sharks have an enormous appetite and can eat almost anything they find in their path. For example, if they run into non-edible objects (trash or junk), they don’t hesitate to eat it – without trying it first. The tiger shark is a fish that prefers to live alone unless it is mating season. They have a status as a “Near Threatened”species callously on the IUCN Red List as a result of commercial and recreational overfishing. Like other species of sharks, their capture is highly demanded because some people believe that their fins have nutritious, healing and aphrodisiac properties. Sharks are also slaughtered for shark fin soup (their fins cut off and their bodies callously discarded to the ocean). At present, there are no specific conservation actions for the tiger shark but some marine conservation organizations are pushing for stopping overfishing. Spending the better part of nine months living on the sea and exploring a variety of marine habitats has renewed my love for the ocean and my desire to help conserve them. To subscribe to (or unsubscribe from) these blog posts, write to jonathan@cellonline.org.